On November 2nd, FFA members from all across the Umpqua District loaded up to compete at the Tractor Driving Career Development. Hosted by the Douglas County Farm Bureau at the Fairgrounds, the event is one of the districts most attended CDEs, and brings in many excited members. In the weeks prior to the event, freshman competitors learned about tractor mechanics, safety, and operation. Today was the day to test their knowledge. 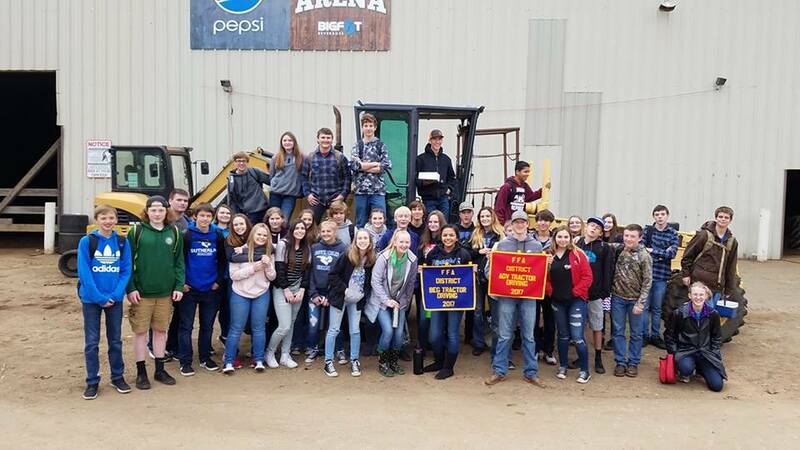 Sutherlin FFA members did exceptionally well, taking home two banners. The Advanced Team placed second, and the Beginning Team received first, showing their hard work paid off. Many individuals placed in the top ten as listed below. Your hands are dirty, but you are happy. You wipe your brow as you turn in your last soils card, and then anxiously wait for the results. You have worked hard and are excited for you and your t­­­eammates. This describes the feelings of FFA members at The State Soils CDE, hosted at Elkton. 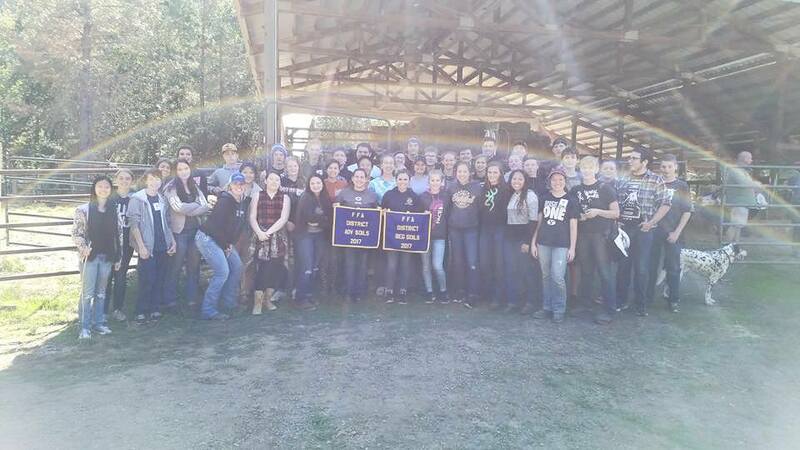 On October 16th, Sutherlin FFA competed in the CDE, and came with two banners. 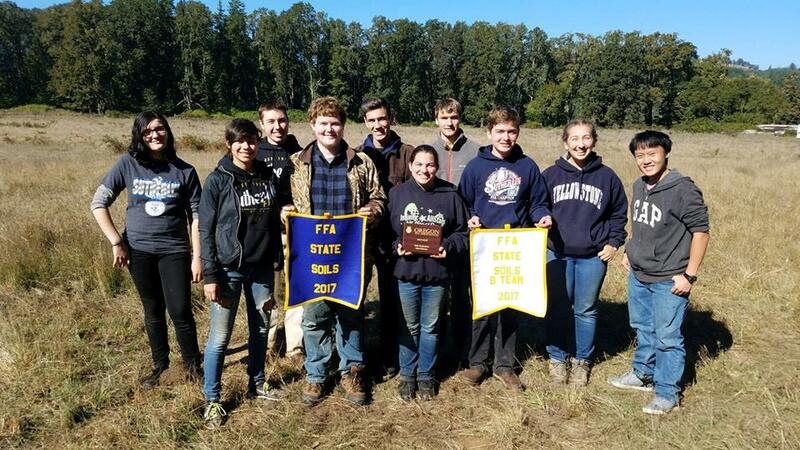 The B- Team placed 3rd overall, and the A- Team received 1st place, qualifying for the National Land Judging Competition in Oklahoma this spring. Members competing very well, claiming spots in the top twenty individuals. Individual results are listed below. FFA is known for its service and care for issues affecting the world. Currently, there are over 700 million people in the world who are malnourished, so Oregon FFA has chosen to help “Drive Away Hunger” through a statewide food drive initiative partnered by Les Schwab Tires. 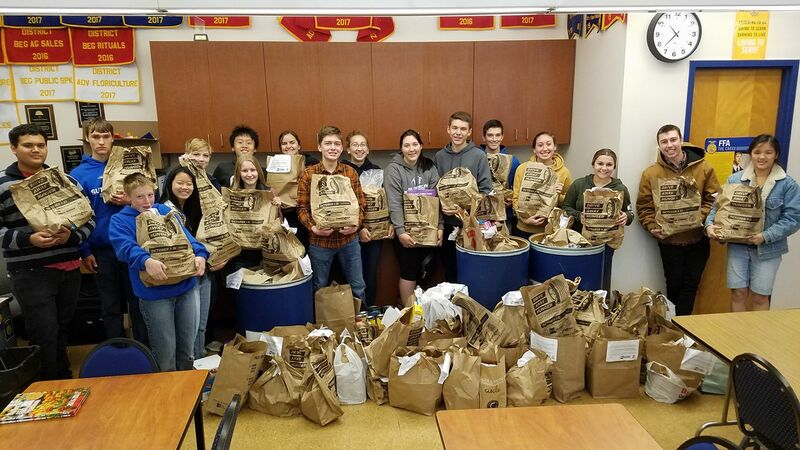 FFA Chapters and Les Schwab businesses across the entire state collect funds and food donations that are send to local food pantries and those in need. On September 9th, Sutherlin FFA members hit the road to attend the three day Umpqua FFA District Leadership Camp. Entitled “Discover Purpose,” the camp was designed to teach students how to take their passions, and use them to serve their communities, thus creating a life of purpose. Just like Zach, leadership camp left a positive influence on many students, helping them grow into powerful leaders. The Umpqua Leadership Conference is held every two years at the Douglas County Fairgrounds for students in local FFA programs (Roseburg, Sutherlin, Oakland, Glide, Days Creek, Myrtle Point, Douglas, South Umpqua). Speakers come from across the country to coach FFA members on what it means to be a leader and how they can use positive influence everyday to better themselves and others. The conference was held this year on September 20th, and Sutherlin FFA was well represented with 122 students in attendance. After the conference, the students who went discussed what they learned from the different speakers. A common answer from students was about the need of every human spirit to receive encouragement from others. Other answers included making the most of what you are given in life and finding a career to feed your passion. These life lessons will help Sutherlin FFA members not only make their chapter better but also their school and community. The Umpqua Leadership Conference is one of the few events in which everyone in the chapter attends. This means that a lot of freshman and less involved members went to the conference and were able to grow as they never have before. The conference will certainly have a positive impact on this school year and the Sutherlin FFA Chapter. This August, Sutherlin FFA members went to the Douglas County Fair to showcase their animals and compete against other FFA members in the district. We had lots of swine, some cattle, and even a duck at fair this year. Sutherlin FFA also set up “FFA Way” which was a part of Douglas Hall filled with projects that have come out of our metalshop, woodshop, and classroom.